Sign up for Broadjam today to follow One Nation, and be notified when they upload new stuff or update their news! ONE NATION is a group of eleven musicians and singers who play songs to inspire and challenge their audiences. They are all Christians by faith and their beliefs come out through many of their original songs, although they speak of different facets of the human experience in their music. All members are experienced musicians and have fashioned a blend of salsa, fusion, rhythm and blues, jazz and rock that is a sound all their own, but appeals to a wide cross-section of society. They see their music as their ministry and as a powerful forum to uplift others through the spreading of the Gospel of Jesus Christ. 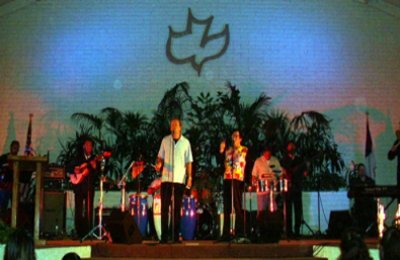 They have played a variety of different venues, such as: concerts, festivals, crusades, churches, prisons, outreaches and wherever there is a need for a positive message through music. ONE NATION is available for concerts in the Southern California area as well as elsewhere.